Whether it is a gaming room, a bedroom or a living room, an ottoman is considered as one of the most crucial and functional items of furniture for each of these rooms! The role of an ottoman or hassock is really versatile; it is basically a couch or piece of furniture with tufted seat and comes with no arms or back! It is always smaller than the size of bigger sofas and also comes with a low height level, hence it can also be used as a comfy footrest or as a mini seat! Upholstered and padded items of sitting furniture are mostly expensive so the ottoman may be too! But we are here with a super creative approach that will allow you to get a super beautiful ottoman at a lowest best price! You can simply DIY the ottomans of your choice by getting crafty with old and recycled materials! 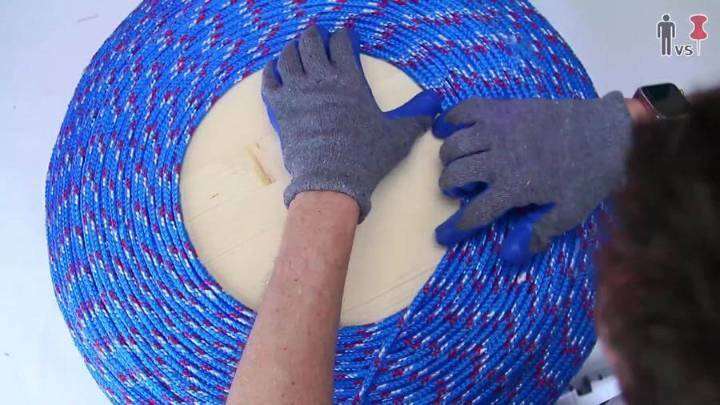 For more brilliant explanation, you can simply check out this DIY tire ottoman tutorial that gives you the step-by-step instructions on how to build an ottoman at home for almost free of cost! 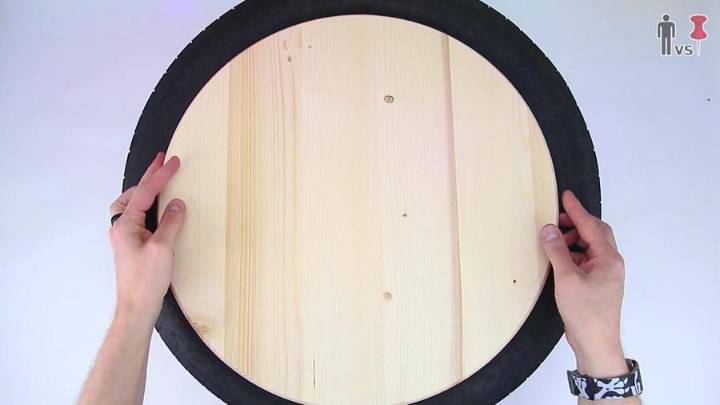 Grab an old tire from any free source and then visit the nearby store to get 2 wooden round boards having size a little smaller than the tire sides and also get some rope strands which may be simple and textured! 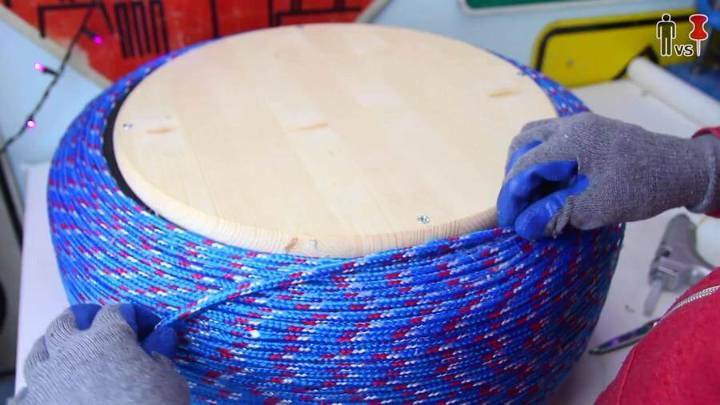 Here the basic of entire construction is that you have to close both sides of the tire with wooden round boards and then to cover the entire tire with rope! 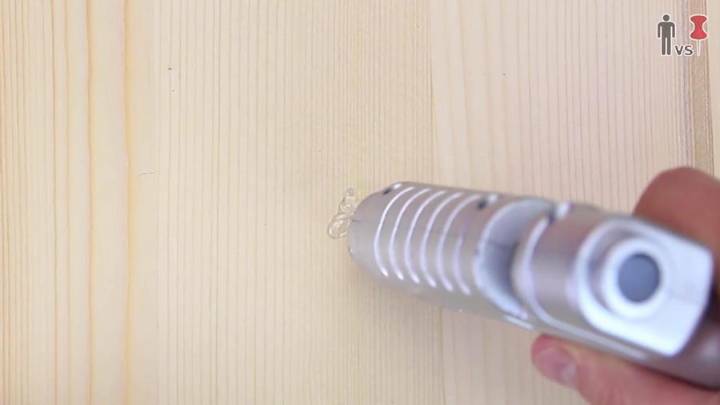 Use screw gun for drilling screws and glue-gun to layer glue where necessary! After seeing this entire tutorial you will feel no more an ottoman deficient! 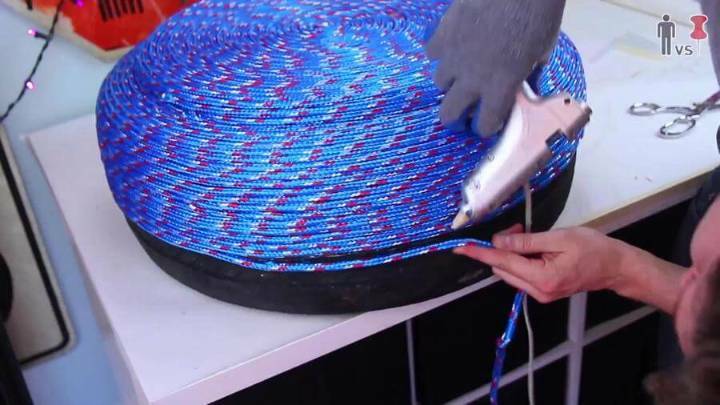 Here half of the project is all about the precise and neat coiling of rope over the tire and around the sides of the tire! This may be a pretty tough and time taking task but you if you go with a little patience, you will surely do it brilliantly! In finishing, you can simple coat the completed ottoman with a sealer! 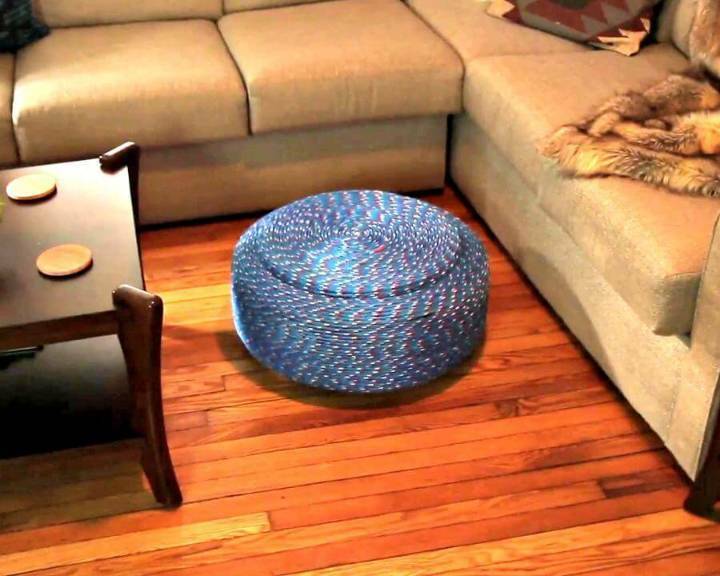 Now the ottoman would be ready to go into any of your decided room after it gets dried! First of all grab an old tire, you may visit an auto shop to get an old tire for free or just paying a little from your pocket! 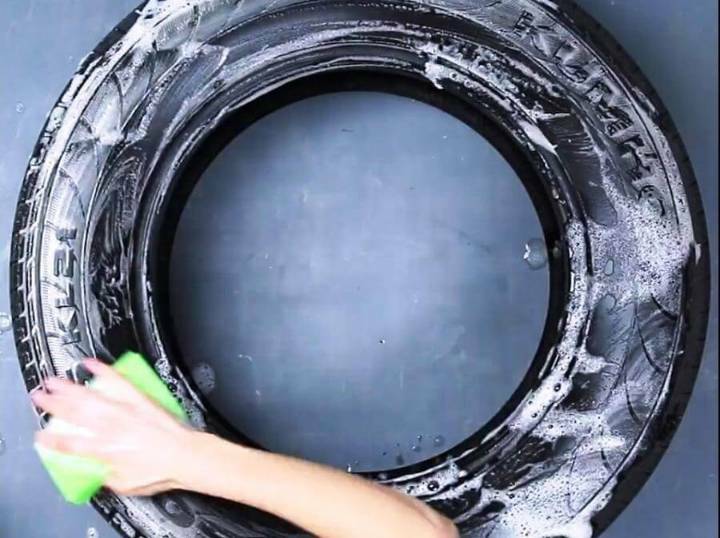 Clean your tire by giving it a nice soapy wash!!! This will remove all the gunk layers from the surface of the tire! Now take out your pieces of round wood which you have selected in size a little bit bigger than the side openings of tire! 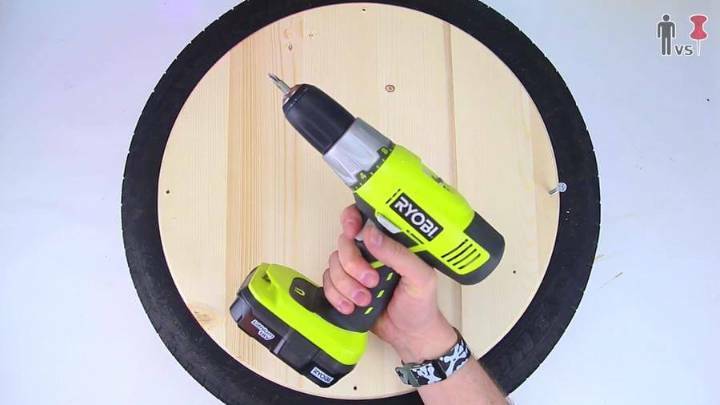 Go for some dry fittings before you screw the wooden boards in place on the tire! 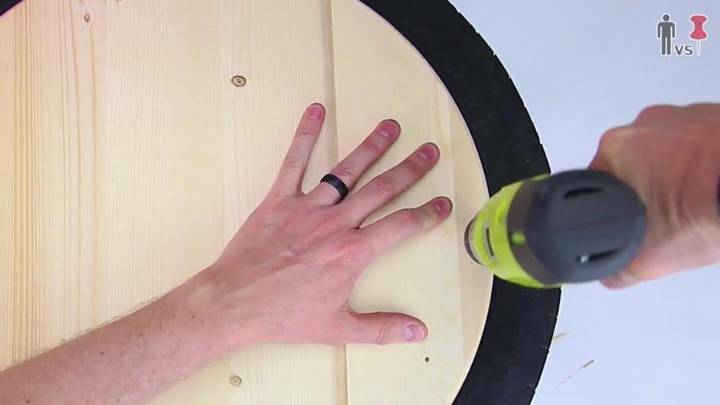 After you mark the exact points for wood-tire junction, just drill holes in marked points on the wood! 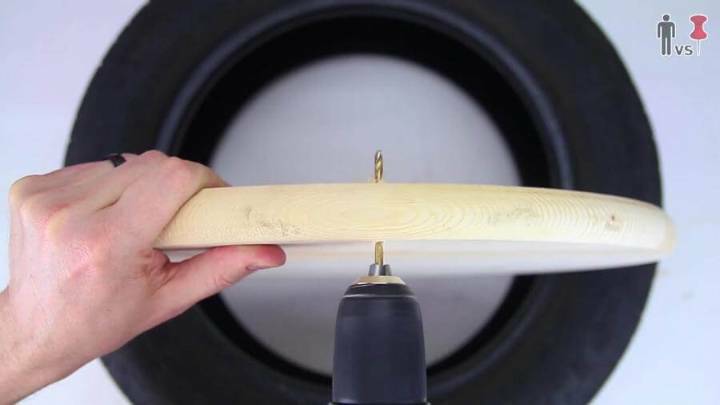 Drill the holes straight through wood to surface of the tire as shown in the preview! 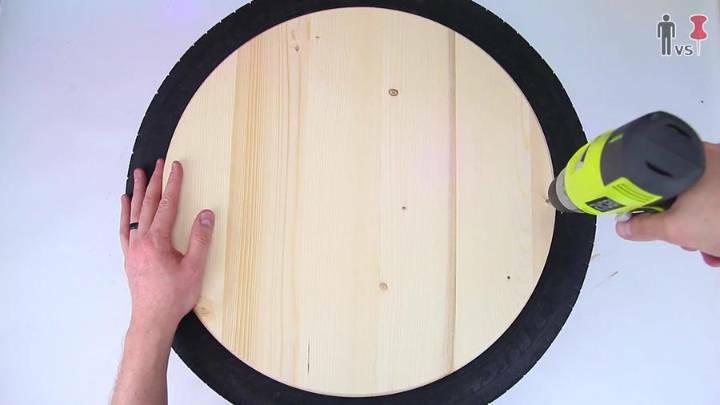 Now secure the wood in place to tire by adding steel screws straight in the wood to tire! 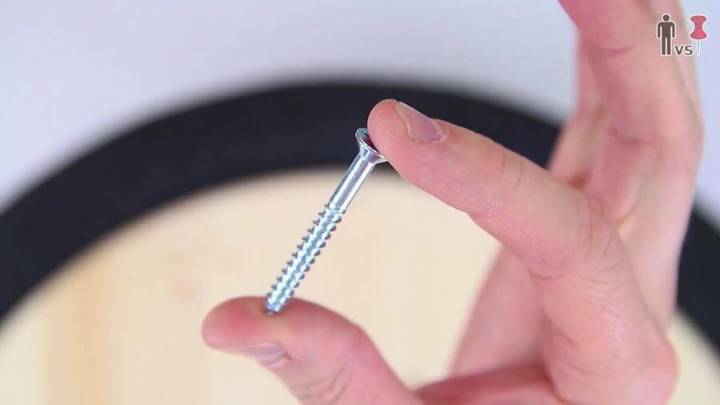 Use a screw gun to drill screws straight in binding wood and tire together! Do the same with other side of the tire! When both sides are done, make sure that if there is any loosely bound screw, if you find one, just make it tight again in place! 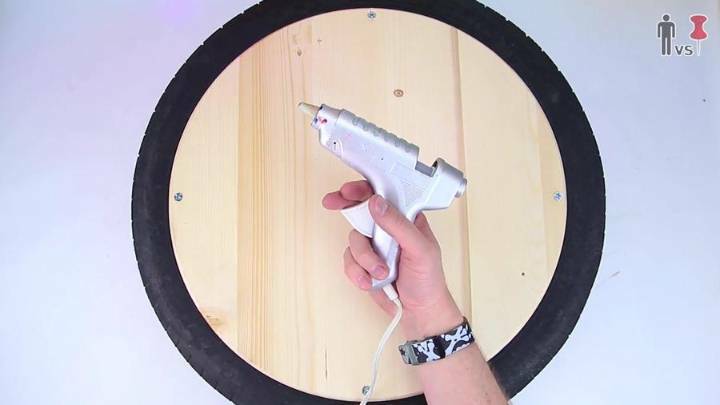 Now make your glue gun and hold it in your hand to start the most important step of the project! 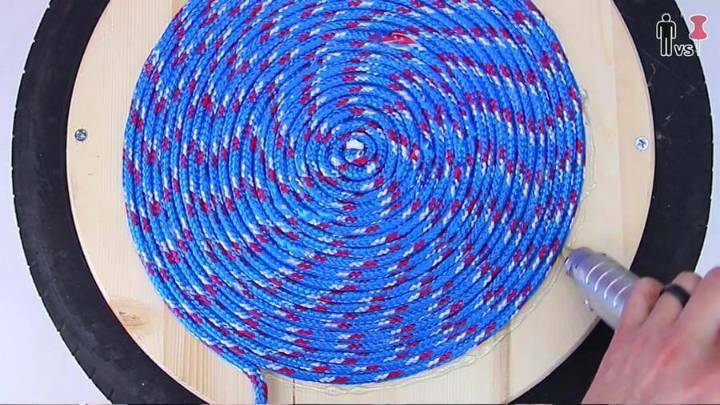 At the same time, bring also your textured rope strands to your work surface or space! You can go with any nautical, rustic or vintage style rope but this textured one is really going to make the ottoman look modern! 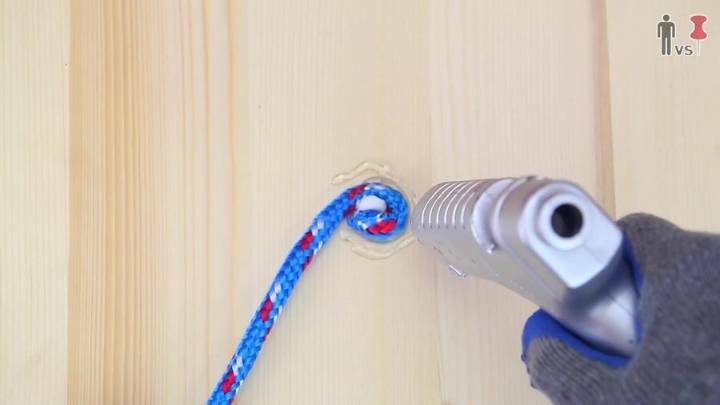 Now layer the glue in the center of wooden board using glue-gun and start mounting the rope on the wood in a spiral manner! 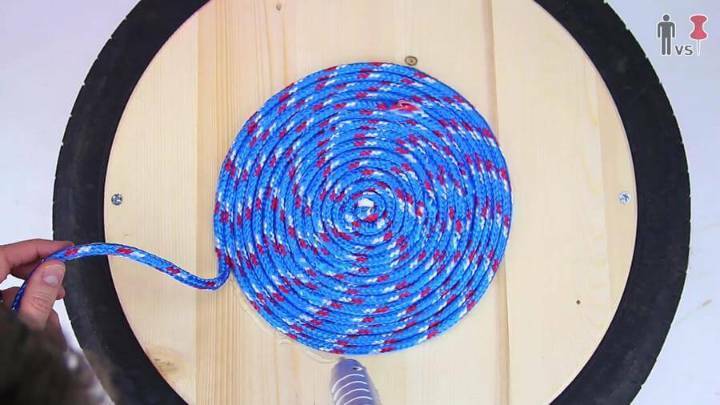 Fold down the very beginning end of your rope and just make it well settled down on the central glued area! 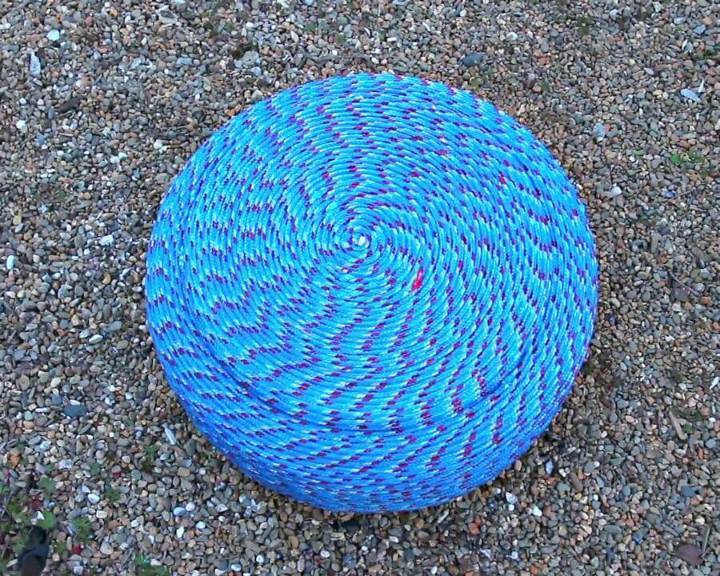 Now start adding the glue around it to add further rounds of rope! 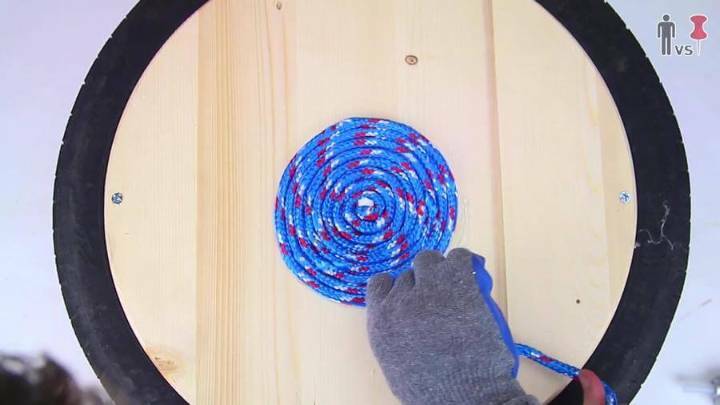 Keep on adding the glue and keep on coiling the rope round and round! 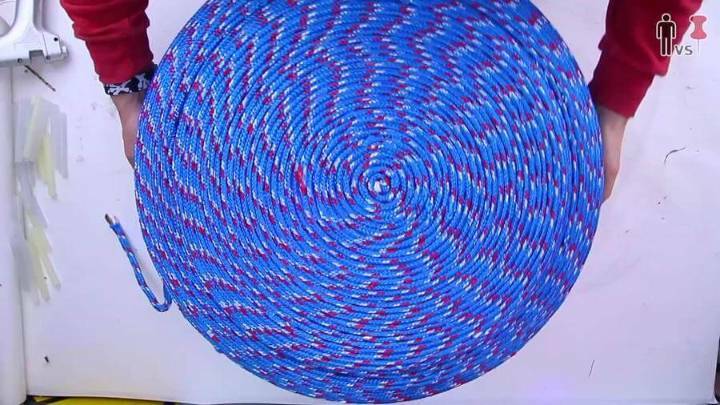 Make each round perfect and keep on coiling the rope in the same spiral manner! 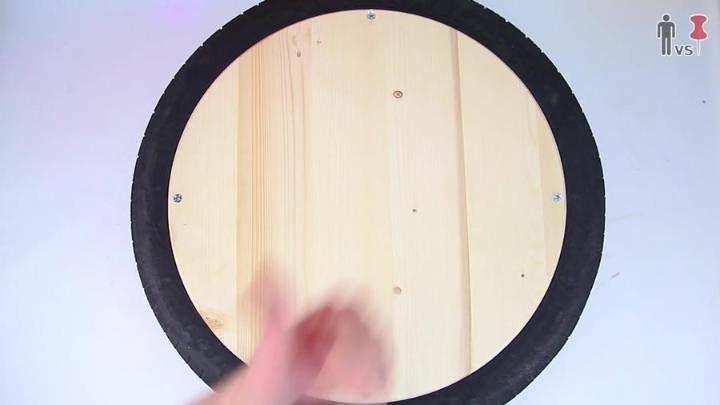 After adding a single round or loop of the wood, push it toward the center for tight and neat filling of entire tire! 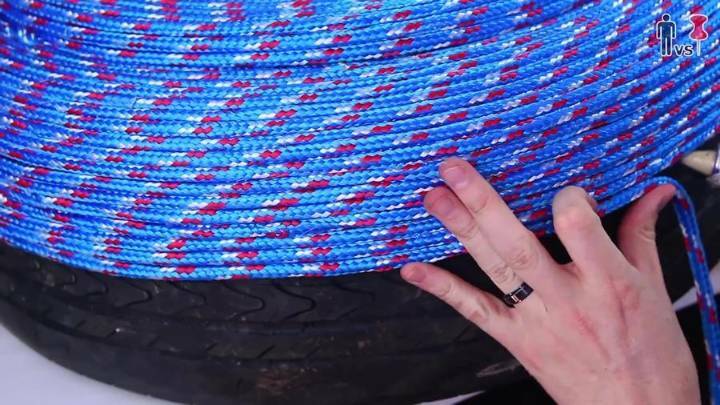 Continue wrapping the rope around the tire until you see no more tire surface! Here neatness and accuracy would be everything! 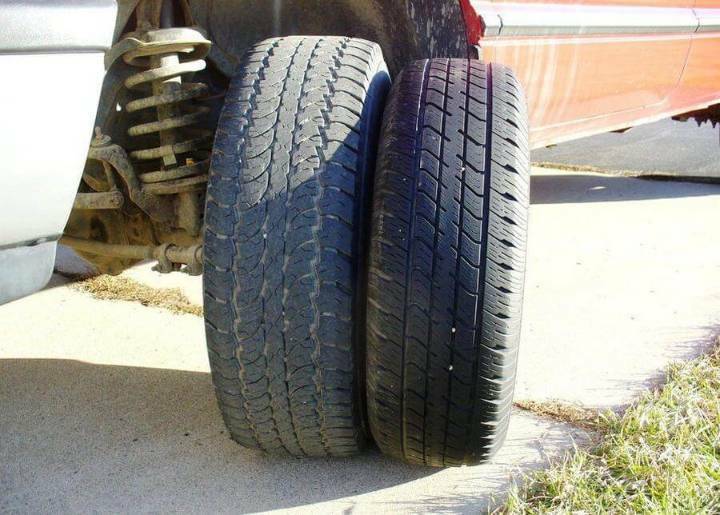 Keep on wrapping the sides of the tire until you reach the bottom of the tire! 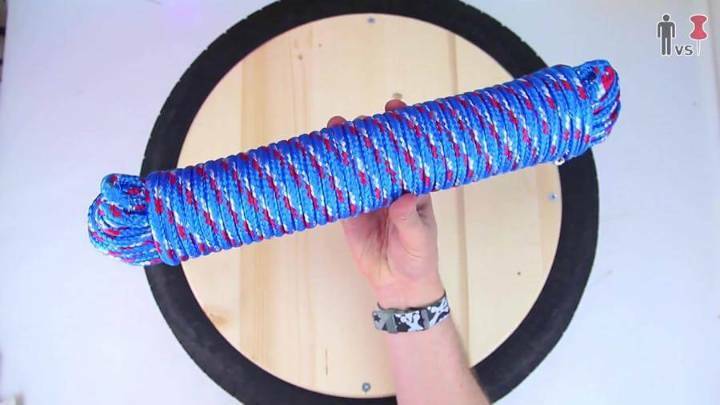 Now end coiling around the rope when you reach the center of other wooden surface of the tire! Now you can give a sealer finish to your finally completed tire ottoman and can let it to dry for some hours to couple of days! Finally it would be ready to add to your modern living room as part time coffee table, as footrest and as a brilliant ottoman! An ottoman is the most desired piece while listing up the living room furniture items as it serves there in multiple different ways! 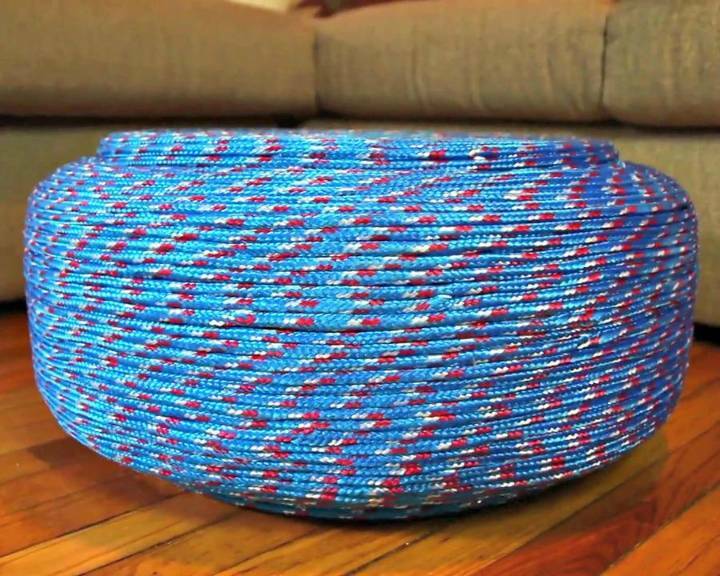 Now time to make your own beautiful ottomans at home using old and recycled items from home!